History: elderly female with back pain and deformity. 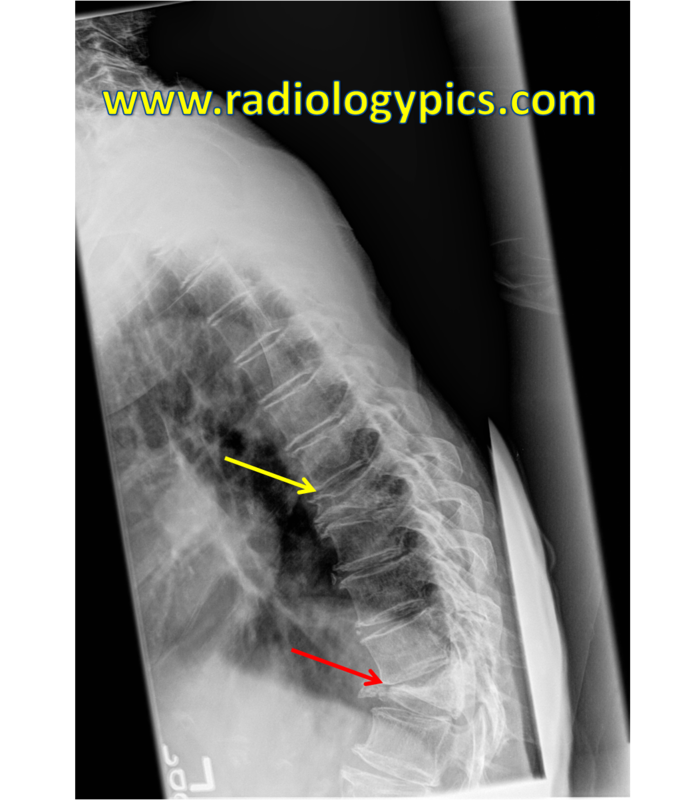 Thoracic Spine Compression Fractures – Lateral radiograph of the thoracic spine reveals two severe compression fractures (yellow and red arrows) with complete anterior height loss and focal exaggerated kyphosis at the lower compression fracture (red arrow). This is a case of multiple thoracic spine pathologic compression fractures secondary to osteoporosis in an elderly female patient. Osteoporosis is a condition of decreased bone mineral density that places patients at risk for fracture. Causes of osteoporosis include prolonged steroid use, post-menopausal state, and normal aging, among others. Osteoporosis is most common in females greater than 50-55 years old and affects almost half of women in this age group. Some may refer to the appearance of the compression fractures in the image above as “vertebra plana,” which means flattened vertebra. The differential diagnosis for vertebra plana includes osteoporosis, trauma (burst fracture), metastases, multiple myeloma, bone tumors such as eosinophilic granuloma or Ewing Sarcoma, and osteomyelitis. 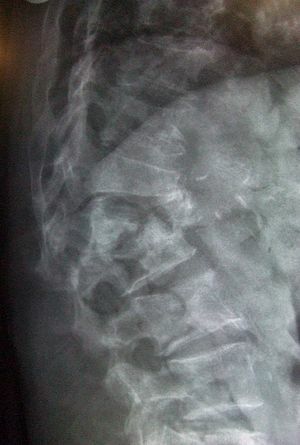 Kummell disease must also be included, which is avascular necrosis of the vertebral body. See an amazing case of vertebra plana with spontaneous healing in a child with eosinophilic granulmoa here from the New England Journal of Medicine. 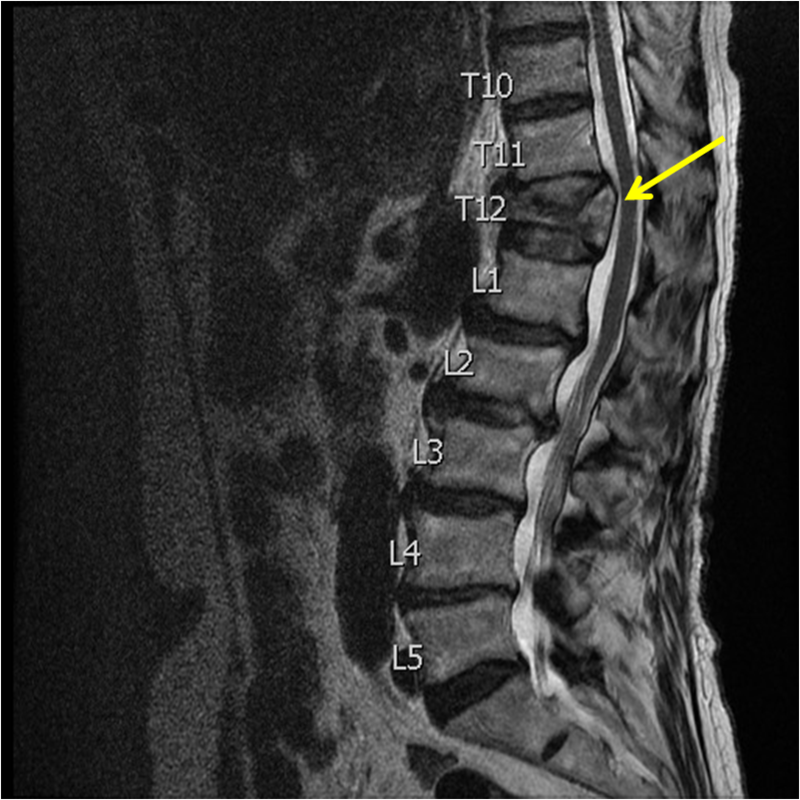 T12 Compression Fracture – Labeled sagittal T2 weighted MR of the thoracolumbar spine reveals a compression fracture of T12 (yellow arrow).